Do you remember those great wooden toys that used to be all the rage back in the day? I love those things and I love that you can actually make many of them yourself. Whether you want something extra special for the holidays or your child’s birthday, or just any occasion, you are going to love the 30 DIY rustic wooden toys that I have found that you can make yourself. Not only are some of these very reminiscent of days gone by, they are all really easy to make and your kids are going to love them. Don’t just stop with your little ones – make these for every child you know. There are toys in here for toddlers to teens and even a few babies. If you have an upcoming baby shower that you are planning to attend, why not make something really special like a homemade wooden rattle? All of these toys are fabulous and they really do take you back in time. Plus, you can make many of these with wood pieces that you have left over from other projects. Use the pieces that you have left over after you’ve made one of these 50 DIY wooden signs. 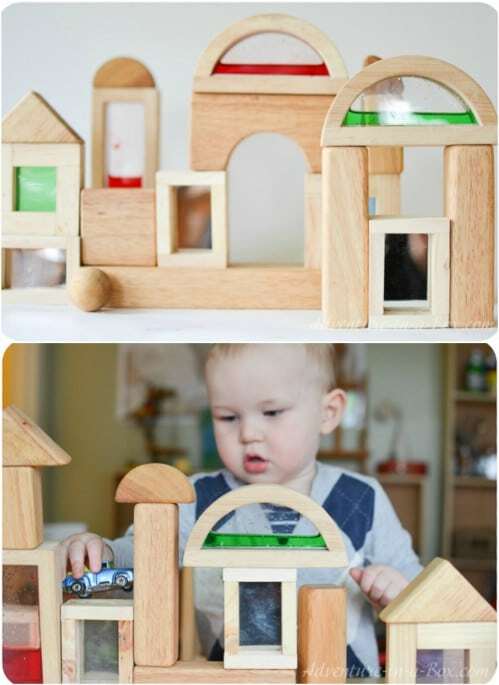 From stackers to toy cars, airplanes and even a great DIY play kitchen – these wooden toys are going to be cherished by your little ones for years. What a wonderful way to give your child something that they could eventually pass down to their own children! I love heirlooms and these DIY wooden toys prove to be some of the best heirlooms you could ever make. And, if you really love working with wood, be sure to take a look at these 40 eco friendly reclaimed wood projects. You can find something for every room in here. You remember those old plastic stacking toys that you played with as a kid – or that your kids played with? Well, this is a wooden version and it is spectacular. 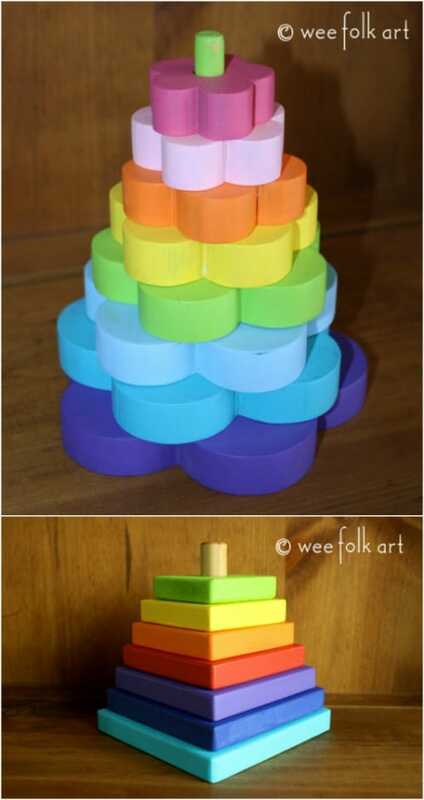 The colors alone are great to keep kids entertained and you make the blocks in different sizes to teach them stacking skills. This one is really easy and would make a wonderful DIY gift for any toddler. 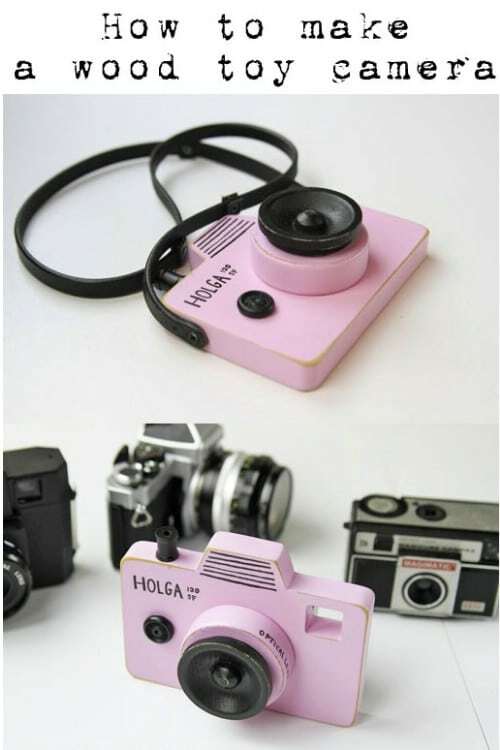 This little toy camera is adorable and it looks so much like the real thing! While your little one won’t be able to actually take pictures with this one, or look through it for images that are preset into it, it’s the perfect toy for toddlers who want to act like their parents and snap photos wherever they go. Plus, it’s a pretty easy plan to follow to make it. 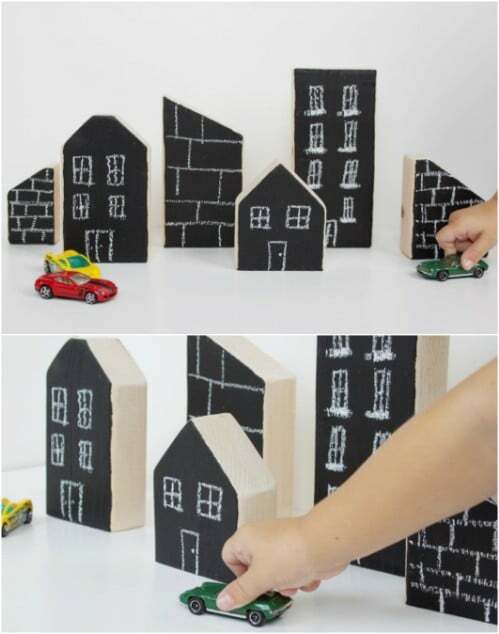 Kids are going to love building their own cities with these chalkboard wooden blocks. You just have to cut the blocks out and then add the chalkboard paint. The fun thing about these blocks is that they can change them up as often as they want. 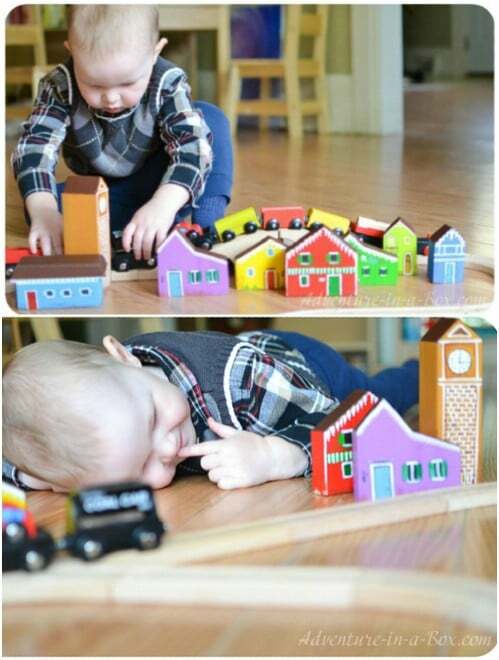 Let them decorate their own little cities with white and colored chalk and then use those blocks for creative play. You have to love a good chalkboard paint project! Little boys love playing with toy guns and this wooden gun is really adorable. 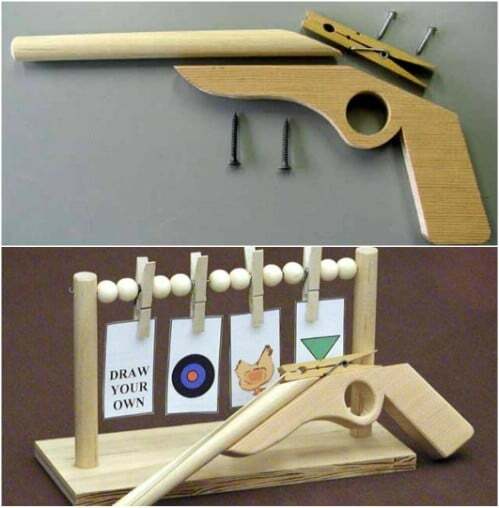 It shoots rubber bands – note that this is something that definitely requires adult supervision during play. You can make this little gun out of just one piece of wood and a few clothespins. Then, create the target and let them practice hitting each one. 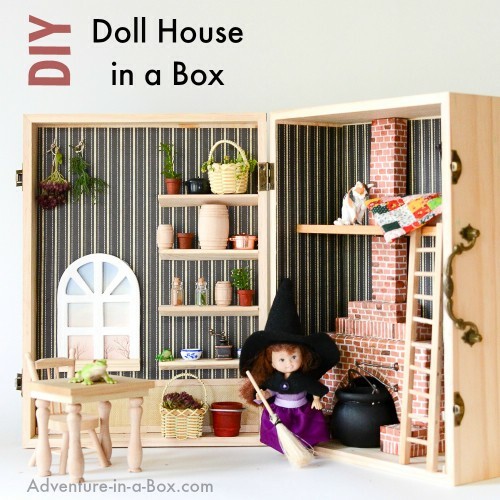 This wooden dollhouse in a box is not only adorable, it is super easy to make. You just need a few standard power tools and you can build your little girl the cutest doll house. Or, you could easily convert this to a garage for little boys…it’s all in how you decorate it. The best part? This one folds up so that all of their toys stay perfectly in place when they are not playing with them. These little blocks are perfect for toddlers who are learning their colors. You could also make them a bit larger and put numbers and letters on them if you wanted. You can find wooden blocks to use or make your own and paint them in numerous bright colors so that little ones will find them fascinating and want to play. Here’s a great idea for some mirrored blocks for babies. These would make the most wonderful baby shower gifts and they are really easy to make. Little ones love looking into mirrors and these little blocks are the perfect size for them to hold themselves. You make these from a Jenga game – buy the cheap one at the Dollar Store for less than $5 – and the mirrors come from mirrored sheets. These are great DIY sensory toys to help children to learn as they grow. 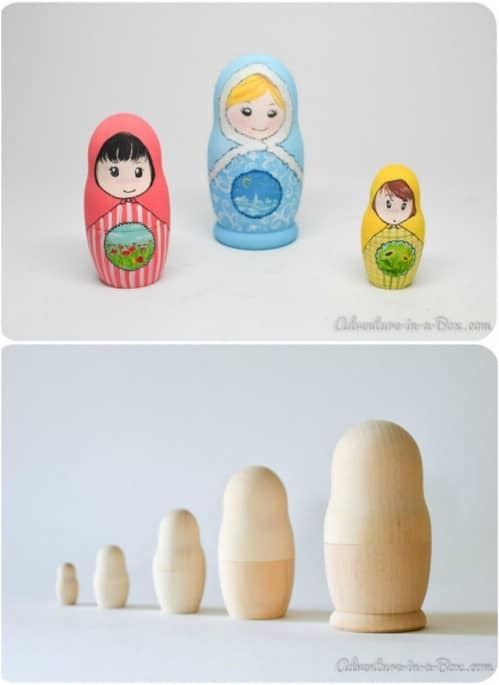 I love nesting dolls and these DIY wooden ones are fabulous. These are great for little ones because they are so easy to hold. You make the wooden dolls and then paint them however you want them. You could give them that great old world look or turn them into themed character dolls – choose a Disney theme or something else that your little one loves. When my girls were young all they ever asked for was a dollhouse. You make this with plywood and a couple of 2X2 boards. It’s an all open design so it’s perfect if you have more than one little girl that will want to play with it at the same time. This would make such a wonderful Christmas or birthday gift and it’s much cheaper to make than it would be to buy. I loved tic-tac-toe as a child. We even had one of those great Toss Across games where you toss bean bags at the game to make your moves – remember those? This oversized tic-tac-toe games looks to be just as fun and you can make it yourself. This is a great toy for kids of all ages and you can totally customize the images to make them even more exciting than just X’s and O’s. This pizza puzzle is great for little ones who are learning shapes and it helps to promote hand eye coordination. You make this from plywood and it’s a pretty easy DIY project. Kids will love playing with it for creative play and it’s a great tool for helping to teach them shapes, numbers and puzzle working in general. 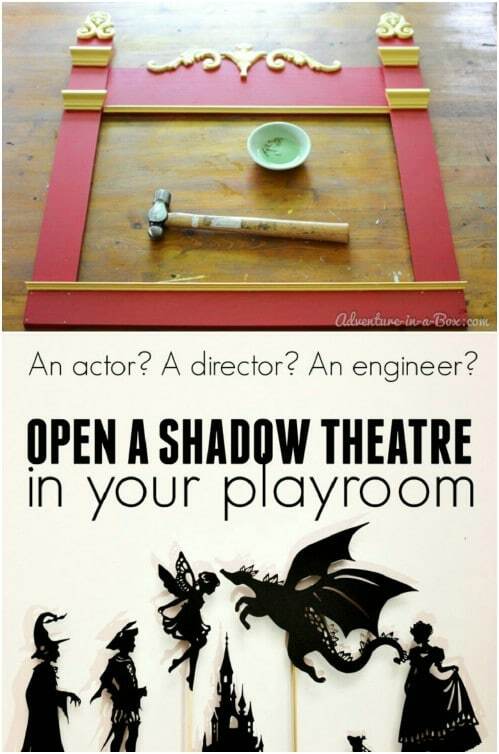 What better way to entertain your children than with their own puppet theater? This one is super easy to build and will give your little ones hours upon hours of play time. You could also make them their own DIY puppets to go with it or if they already have puppets, then you’re halfway there. Puppet theaters are great for encouraging creative play and this one is totally customizable because you make it yourself. 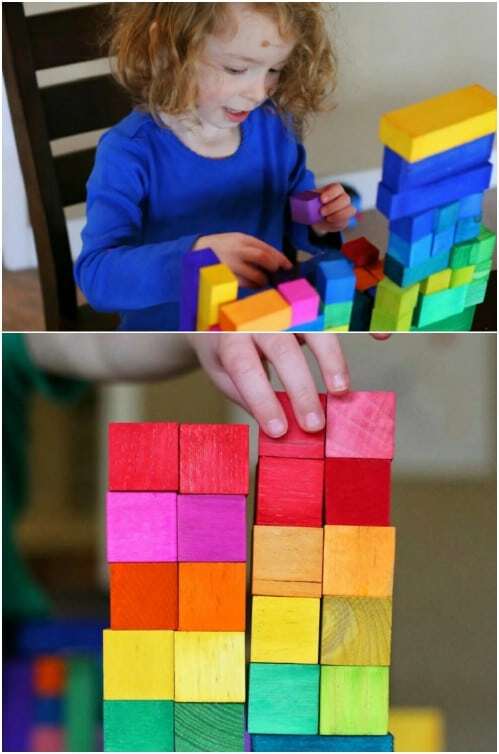 Building blocks have been popular with kids for decades and you can make your own with this easy to follow plan. These are done in different sizes for creative play and you paint them any number of colors and you could even make them in different shapes. A similar set will run you about $60 or more at most toy or department stores but you can make this set for the price of a 2X4 or two. 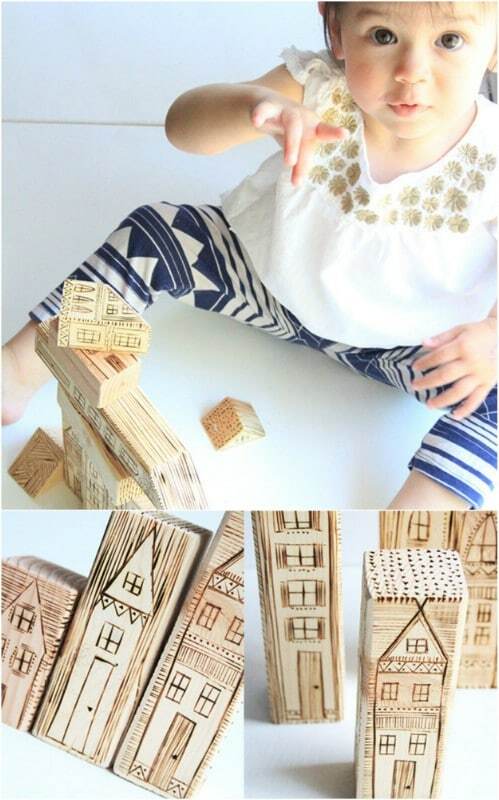 Turn that old board into these adorable city house building blocks. These are really cute and boys and girls alike are going to love playing with them. Once you have the houses and buildings cut out, you just paint them to resemble your favorite city block. You could even do these to match the houses in your neighborhood. They promote creative play and are perfect for little ones who are working on their hand eye coordination. Skip paying a hundred dollars or more for a rocking horse at your favorite toy store. You can build your little one his or her own rocking toy from a few boards that you have left over from other projects – and you can customize this one however you want. It’s a pretty easy plan to follow and makes the most adorable wooden rocker. This would be a wonderful first Christmas or baby shower gift. 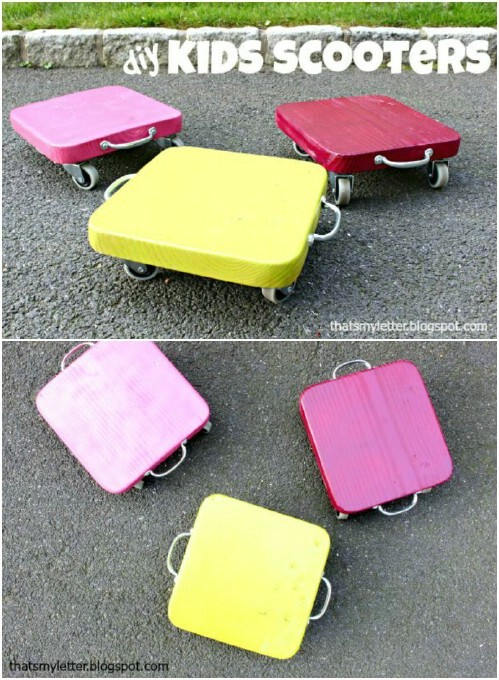 Turn an old board and a few wheels into the most amazing scooter for your older children. These are perfect for kids in school and they are so much fun. 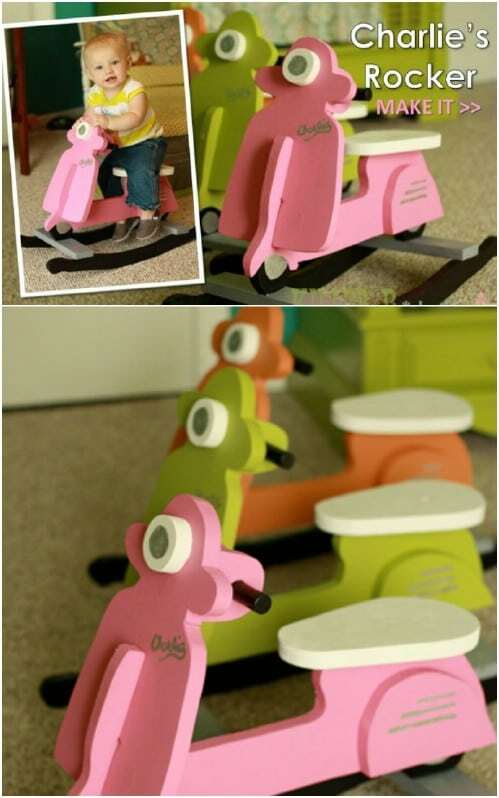 You add handles to the sides so that your little ones are safe when they are scooting and this is a lot safer than a stand up scooter. Plus, this one is really fun to make and your kids are going to love it. Play tents are great but they can be a bit expensive, especially the sturdier ones that will last for several years. You can build this one yourself from pine boards and canvas and it’s practically guaranteed to last as long as your children are young. The plans for building are super easy to follow and you could even adjust the sizing if you need to make it larger or smaller. And when they grow out of it, this is the perfect opportunity to repurpose those kids toys. 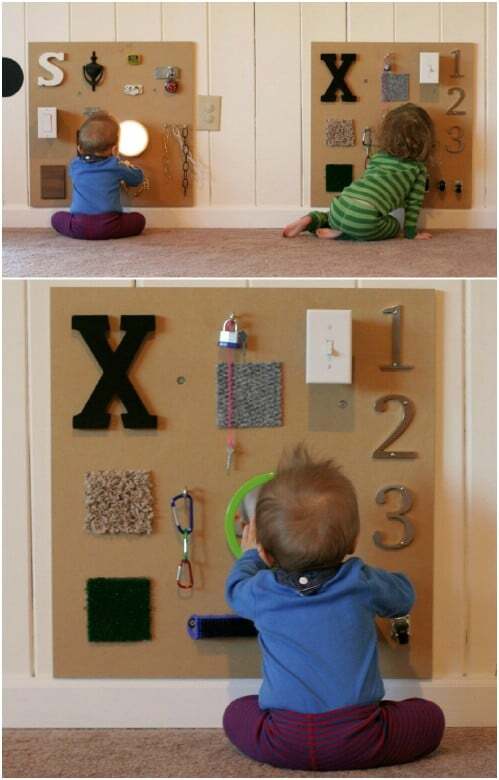 You can turn an old piece of plywood into a great sensory board for your little one. Sensory boards are great for teaching babies and toddlers about shapes, colors, textures and so many other things. These baby activity boards run close to $100 at most toy stores but you can seriously make this one for only a fraction of that – and kids are going to love it for years. Wooden blocks are so popular with little ones. Remember those little ABC blocks? 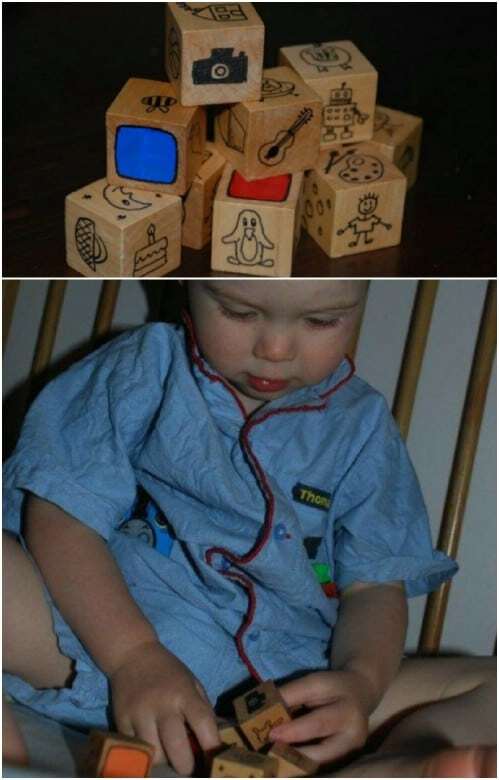 Well, you can give your little one the same playing fun but with story blocks. Story blocks allow your little ones to tell stories as they play, which really helps to develop their creativity. 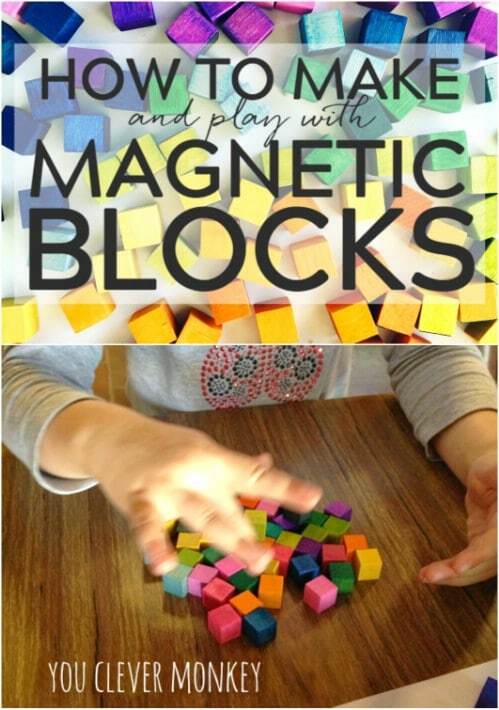 Plus, these little wooden blocks are great for hand eye coordination and sensory play, as well. Texture blocks work like sensory boards to help little ones to learn shapes and textures. These handmade texture blocks are super easy to DIY and you can add any shapes or textures that you want to customize them. Textured scrapbook paper, wool felt and wooden shapes give you the textures that you add to your DIY wooden blocks for hours of fun play for your little ones. 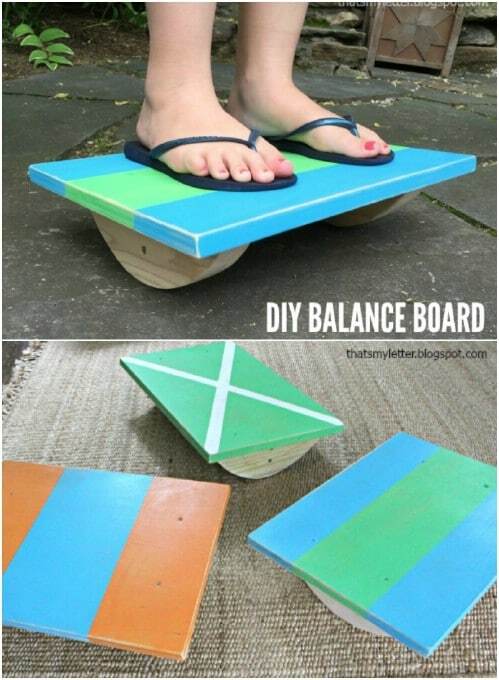 Balance boards are so much fun for older children and teenagers. These DIY balance boards are made with plywood, 2X4s and 2X3s and the plan is really easy to follow. 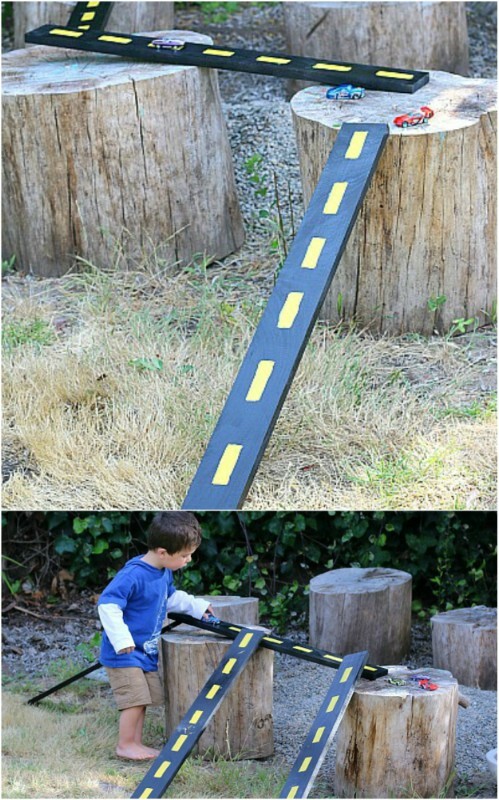 You can paint these however you want, customizing them for your child and they are so much fun to play with. They also help to teach balance so they really come in handy if you have a child into sports or gymnastics. 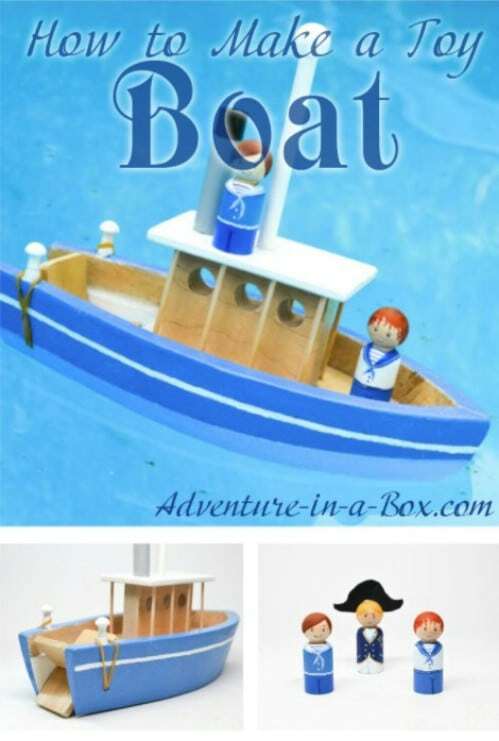 Every little boy…and some little girls…wants a toy boat and this wooden one is the perfect DIY gift. These are pretty easy to make and you can add wooden people to make play time even more fun. You just need a wooden board and a few other woodworking supplies to make this one and it won’t take you long at all to have it finished. And there are some amazing DIY organization projects to help you keep those toys all put away when they’re done. 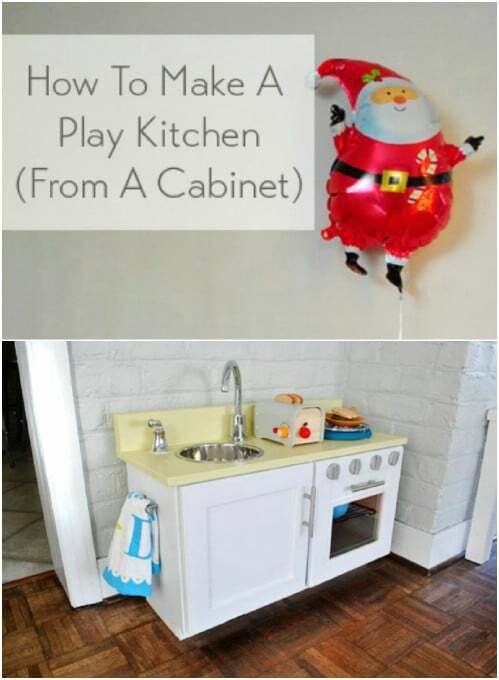 You can make this play kitchen out of wood that you have left over from other projects or you could even do it from an old cabinet, which takes away a lot of the work. 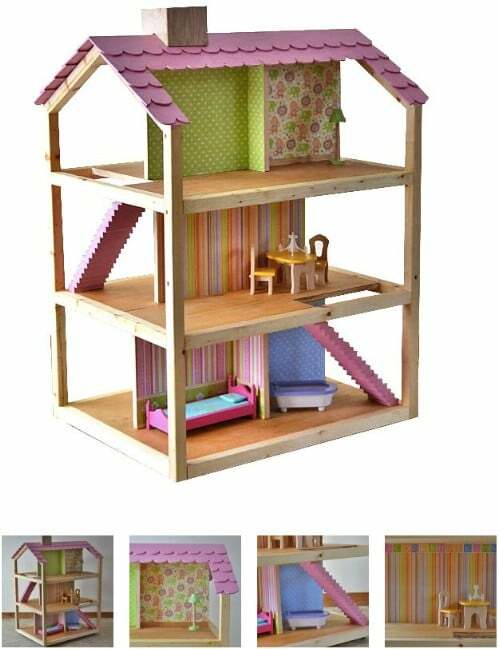 If you have a little girl, she’s going to love this play kitchen. It’s so roomy so there is space for all of her play foods and dishes and imagine how much fun she will have cooking up a storm with this. Alternatively, you could fashion it a bit differently and turn it into a workshop for little boys. 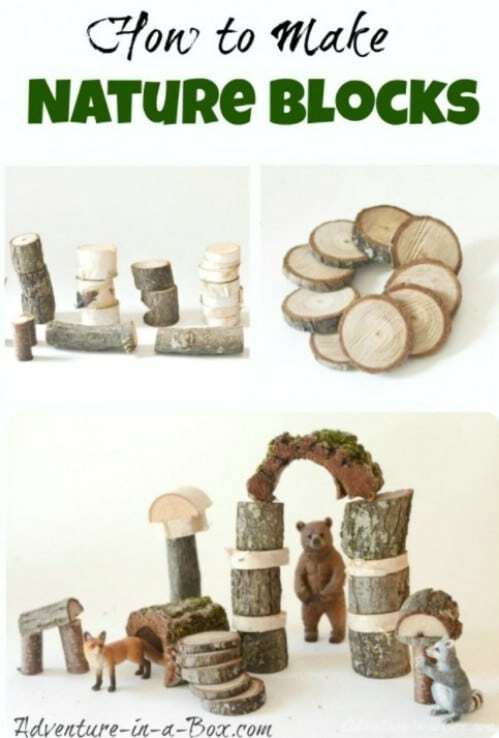 These nature blocks are really fun for kids. 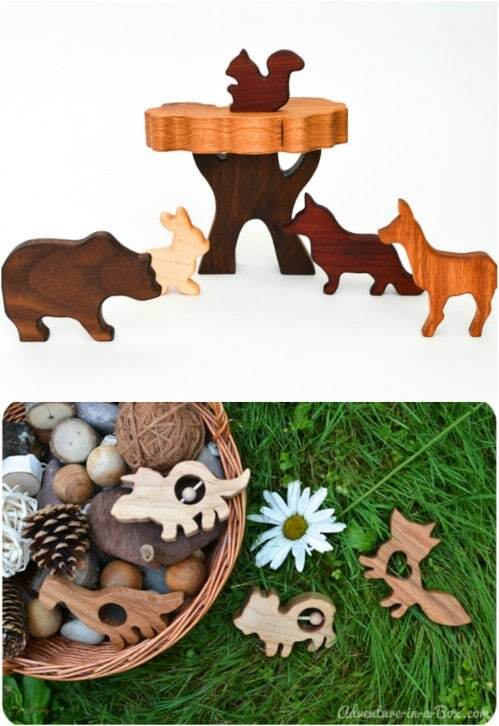 They can make so many wonderful nature scenes with these and other toys and these are probably the cheapest DIY wooden toys that you could make. You don’t need to buy any wood for these. You make them from sticks and twigs that you have outside, so they’re free to make. And, you can pair them up with cheap woodland creature sets from the Dollar Store for hours of fun playtime. 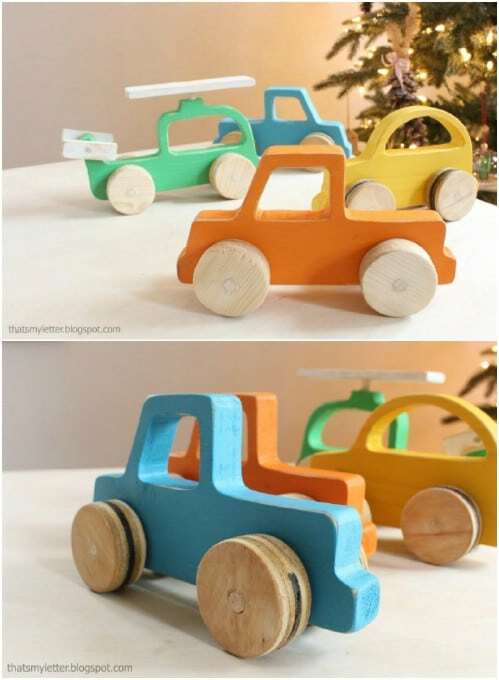 Kids are really going to love these little wooden vehicles that you can make in no time at all. These are super easy and they’re perfect for toddlers and babies because they are so lightweight and the hollowed out centers make them perfect for helping little ones to learn to grasp. These offer hours of fun creative play and are great for helping your little ones to develop hand eye coordination. These house blocks are gorgeous thanks to the wood burning that you do. These are really easy to make, despite their intricate details. They are perfect for toddlers to pre-teen and you can make them in any number of shapes and sizes to promote hours of creative play. Plus, wood burning is so much fun so you’ll have as much fun making these as your kids do playing with them. These wooden racetrack or car ramps are super easy to make and they are perfect for little boys who love racing or jumping cars. You could even make some homemade cars and trucks out of wood to go along with these. And, you can do them in different shapes. Straight is great for ramps but you could also make a few curves to give them an even more exciting playtime. 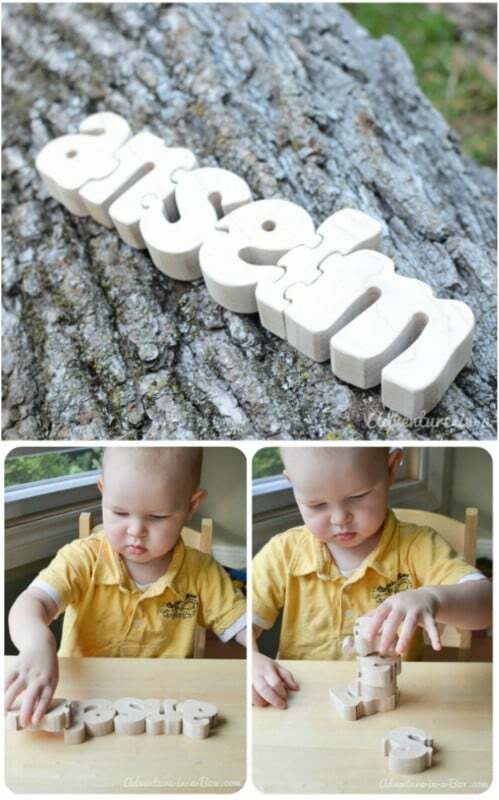 Not only does this personalized DIY wooden name puzzle help your little ones to learn how to spell their names, it doubles as bedroom décor when they get too old to play with it. This one is pretty easy, although you will need to know how to use quite a few different woodworking tools. They’ll have hours of fun learning to put their names together and then they can hang this in a great shadowbox frame when they get older. If you know someone who is expecting soon, these DIY wooden teethers and rattles are the perfect baby shower gift. You can make several of these from one wooden board and they really are not that complicated to DIY. Plus, since you’re making these from wood, you won’t have to worry about what chemicals may be included in their teether – plastic teethers can contain so many harmful chemicals. 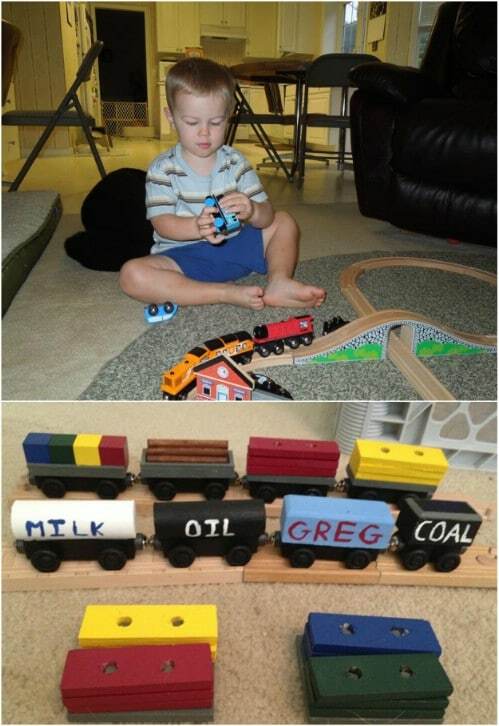 Give your little boys the most wonderful gift with this DIY wooden train track. This is such a wonderful gift idea for the holidays or any occasion. The train tracks are pretty easy to build and you can add a DIY wooden train, too or use this with just about any train set that you may already have. This would be so gorgeous around a Christmas tree to create a rustic farmhouse Christmas, as well.